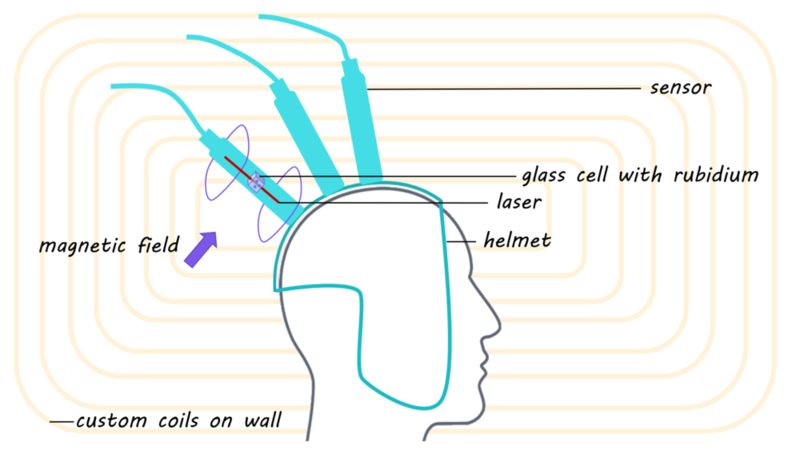 Magnetoencephalography (MEG) uses superconducting sensors that are very sensitive in order to pick up miniscule magnetic fields generated by the brain. However, neural signals can easily be distorted by other signals in the environment (e.g. from electronics or muscle activity). The MEG system is also large and stationary, and sensors may be far from the brain depending on head size, which weakens the signals. This week in Nature, Boto and colleagues describe a new wearable MEG system that mitigates issues of weak signal and high noise. The authors aimed to move towards real world applications for MEG by building a system for which subjects are able to move around freely. The new MEG system works via ‘optically pumped magnetometers’; sensors containing rubidium vapour in a glass cell, and a laser beam which shines through the cell. With no magnetic field, lasers polarize rubidium atoms in a single direction, and light from the laser beam through the glass cell is maximized (detected by a photodiode (light sensor)). However, when a magnetic field perpendicular to the laser beam is present (e.g. during neuronal activity), light transmission drops, because rubidium atoms are no longer aligned with the laser beam. Sensors were attached to a 3D printed helmet, custom-fitted to the subject. To test whether signal quality was adequate with the new wearable MEG, data were recorded while the test subject moved their finger and 1) stayed still in the new system, 2) moved their body in the new system, and 3) stayed still in a traditional MEG system. The subject also played ping pong in the new system. To block magnetic interference in the environment, the system was placed in a magnetically shielded room. To reduce the effect of the earth’s magnetic field, large custom coils were placed on the walls in the room; this was key to enabling the subject to move around. When the subject moved their finger, typically found changes in activity were detected in a region of the motor cortex corresponding to the hand. The signal strength (signal-to-noise ratio) and localization of the brain activity was not different whether the subject was in the traditional MEG system, staying relatively still in the new system, or moving around (shaking and nodding head and drinking; approximately 10 cm head movement) in the new system. Turning on the custom coils they placed in the room to counteract the earth’s magnetic field reduced the earth’s magnetic field 15 fold. Finally, they were able to localize beta frequency activity to the arm and wrist areas of the motor cortex while the participant engaged in a ping pong game that required unexpected, natural head movements. This is the first wearable neuroimaging system to be developed, demonstrating that it is possible to conduct a MEG study while a subject is moving around. It is now possible to map the whole brain non-invasively at a high temporal and spatial resolution in natural experimental settings. For example, it is possible to study people while they move around or perform a spatial navigation task, or to study people with movement or neurodevelopmental disorders — clinical populations for whom staying still while being imaged is difficult. E. Boto et al., Moving magnetoencephalography towards real-world applications with a wearable system. Nature (2018). Access the original scientific publication here.